the cake + the knife, a love story: Smile, you're in Kensington. Hello, my name is Amanda, and today i'll be your little hypocrite. It's not organic, it's not home made, it's not especially high in any vitamins or nutrients, it's certainly not wholefood in any way, shape or form, but yeah, i'm telling you to eat it at least once in your lifetime. 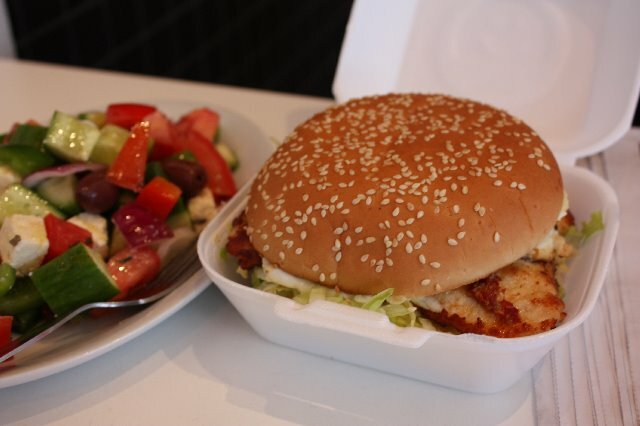 The Kensington Hot Jumbo Ogalo Burger: The Definitive Chicken Burger Experience. If you drive along Anzac Parade in the right direction for long enough, you will eventually see one of Sydney's cutest road signs: "Smile, you're in Kensington". Im a pretty grumpy person, but that sign does it for me every single time. Perhaps the reason that Kensington is a municipality of little grinners has something to do with the newly renovated Ogalo shop. Dan has been raving about these burgers for a good while now, word is they're not just the best chicken burgers in Sydney, but they're even better than all the other Ogalo outlets. I mentioned to Tatsu that he had to try them and he told me someone had already raved to him about them, so the word is definitely out. The shop looks very sharply run, always clean, always fresh. In fact, they begin to grill the chicken for your order only after you've placed it. What ensues between the placing of an order and the eventual acquisition of the burger, from what i've witnessed in dan, is a highly agitated, agonizingly slow succession of torturous time during which both desperation and something akin to a deep Nabokovian yearning play out in his pleading eyes. 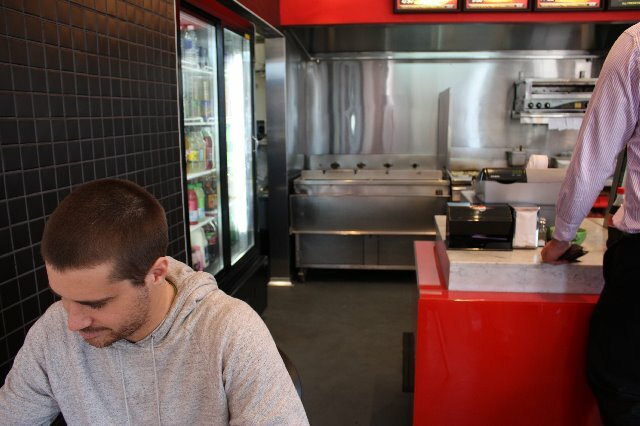 Dan is patience personified, but in the 5 minutes or so it takes for him to get his burger, any Jack Johnson calm he exudes goes right out the window, he wants his burger, and he wants it now. When asked to explain the taste, he gets a dreamy look in his eyes and explains how the chili sauce is an oily type of chili and not a saucy type, how the cheese and the chicken twist together and taunt his tastebuds (wait, thats me, not him), how the bun is perfect, like the soft cheek of a gentle lover (me, again) and the chicken grilled to succulent perfection. I have noticed that in places where the chicken tastes good, they usually cut it quite thin prior to grilling. This allows chicken to cook quicker and crisper, chicken that has grilled for too long usually doesn't taste quite as nice. Their salads, believe it or not, are so fresh and flavoursome, you wouldn't believe this is a fast food joint. Dan gets the Greek salad on most days, and it's always fresh and dressed beautifully. I've only looked (more like lusted) at the hot chips, they don't look half bad either. This shop is usually full of hungry workers and students, pop by during the day or later at night and try what is really a very phenomenal burger. I tried to suss out while they were cooking it what was making the Kensington outlet stand head and shoulders above other Ogalo stores, all i've got is a few theories, but no solid answers. What ever they are doing, they are doing it well. I asked Dan if he has ever tried the chicken or other salads on display: "it's just the chili burger, dude". Who can argue with that? At $12 for the Hot Jumbo Burger, Greek salad and a drink, you're arteries may cop it, but your wallet will be just fine. That's the happy ending. Kensington! Who knew. AT: 160 Anzac Parade, Kensington (don't forget to smile). Lost somewhere in the Milky Way. About Life, Rozelle: The SuperDuperMarket. Gertrude + Alice, Bondi: The Ulteamate. Bourke Street Bakery (aka, The Inside Man)..
Don't forget The Essential Ingredient. You CAN make friends with salad..